Bulfrek is a Nord citizen who is in the service of Jarl Skald the Elder. 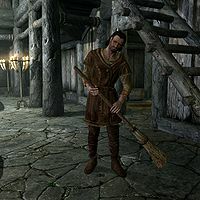 He works in the White Hall in Dawnstar, where he can often be found sweeping the floor, making comments about his dislike for Skald under his breath. However, the level of disdain between the two seems to be mutual, and the jarl will occasionally make fun of his unfortunate servant, commanding him to do meaningless tasks. If you speak to Bulfrek, he will inform you that his family have been serving the rulers of the Pale for generations. Bulfrek can be found sweeping the floors of the hall at all hours of the day, stopping for breakfast at 7am, lunch at noon, and dinner at 7pm. If the Imperial Legion takes over Dawnstar, Bulfrek will be exiled to the Palace of the Kings in Windhelm. He wears a belted tunic and a pair of boots. He is equipped with an iron dagger and carries a selection of lower-class loot and gold. When you approach him, he may say to you: "By the Divines, I'm tired." or: "Just a servant of Skald the Elder. Not worthy of time or consideration." He'll continue sarcastically, saying: "Oh, it's just wonderful being Skald's servant. He's not demanding in the least." He may also say: "My family has served Skald Felgeif's family for generations." as well as: "There's no honor in being a Jarl's servant. No Sovngarde waits for dust cleaners." If he is in Windhelm, he will still be tired, but will also express his bitterness: "Jarl gets booted from Dawnstar, and I'm still stuck cleaning up the dirt." and "What do you want, Imperial? Ain't my life hard enough?" Bulfrek: "Skald, if you don't mind sir, I have a request." Skald: "You, have a request of me, Bulfrek? This should be interesting." Bulfrek: "Well, I was thinking sir, with the war going on and all. Maybe, I could enlist? Fight the Imperials?" Skald: "A servant? Enlisting in the Stormcloaks? Ah, Bulfrek, that's why I like having you about. You're always good for a laugh." Bulfrek: "Uh, yes sir. That's me. The oafish servant." Skald: "Bulfrek, I have an order of swords and armor from the local blacksmith coming here. I need every piece polished to a fine shine." Bulfrek: "Yes, my Jarl. We could hardly waste anyone else's precious time on such a tedious task." Skald: "Exactly, Bulfrek. You always know your place." This page was last modified on 19 October 2013, at 16:53.